Why Do I Need a Splash Page for My Business? A splash page is a great way to bring in visitors to your business with a visual “Call to Action”. A “Call to Action” (or in marketing terminology, is a way to provoke immediate response,) is very important when marketing your website. Showing your website’s front page doesn’t always do the job of enticing a viewer into a conversion. It’s best to use an attractive graphic with a convincing headline. 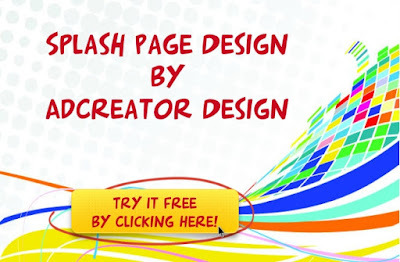 With AdCreator Design you can inexpensively design your own splash pages yourself. If you don’t have time, I can do it for you at a very reasonable cost. Much easier than Photoshop, AdCreator Design takes most of the hassle out of designing. A Splash pages is an ad to drive people to your website and to increase conversions. A splash page is an introduction of your main website that displays some of the content to the viewer. It uses an eye-catching graphic with an important message to lure visitors into your site. A splash page can help communicate valuable information to your readers and creates a beautiful introduction of your website. To find out how to make a splash page, please visit this post: How Do I Make A Squeeze Page? Tutorial with Screen Shots.